The second of the two Dynamite Girls in my Christmas in July pile! I love neckties on my ladies and I love Neve's mixed ethnic background. 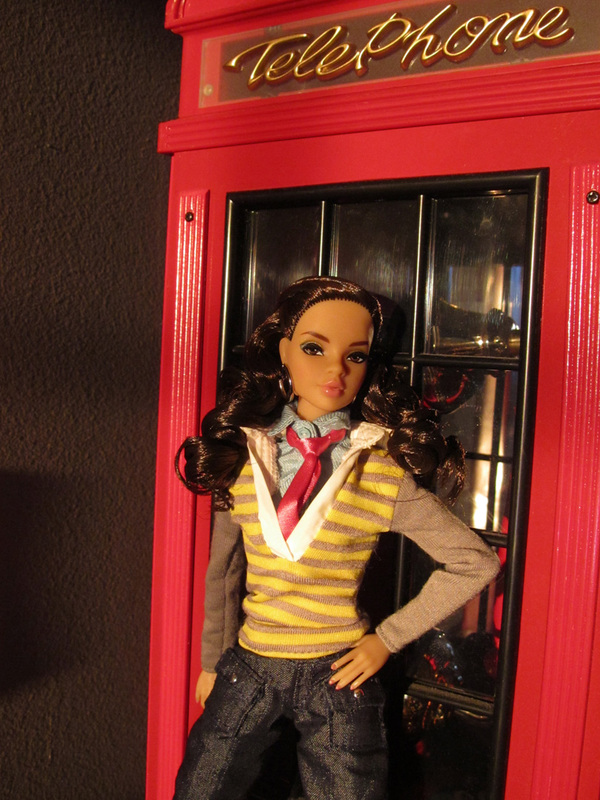 Naturally, I loved Neve's new incarnation and she had to come home with me! I'm tempted to free her tied-up curls like I've done with my first Neve but I suppose they need some variety in hair style. 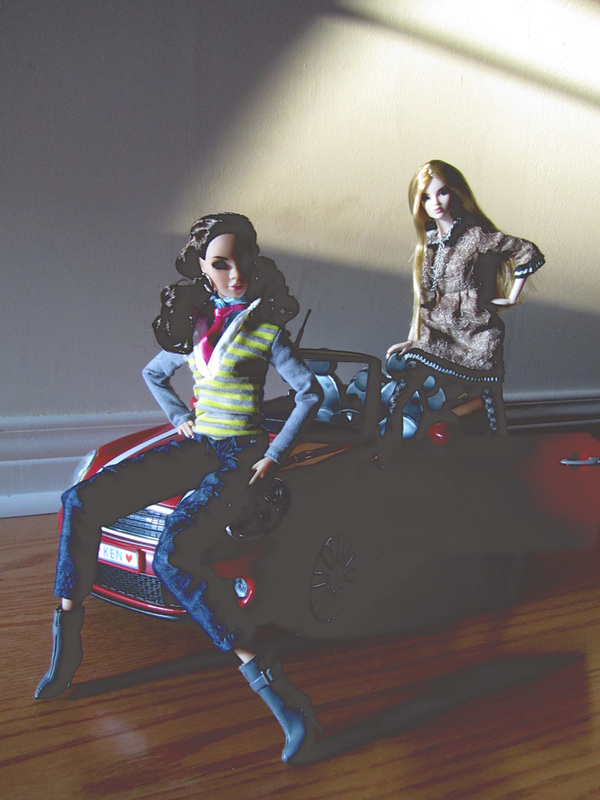 Here's Neve and Jasper posing on Bebe's car at sundown....Loving Neve's "leather" boots like I love Jaspers! 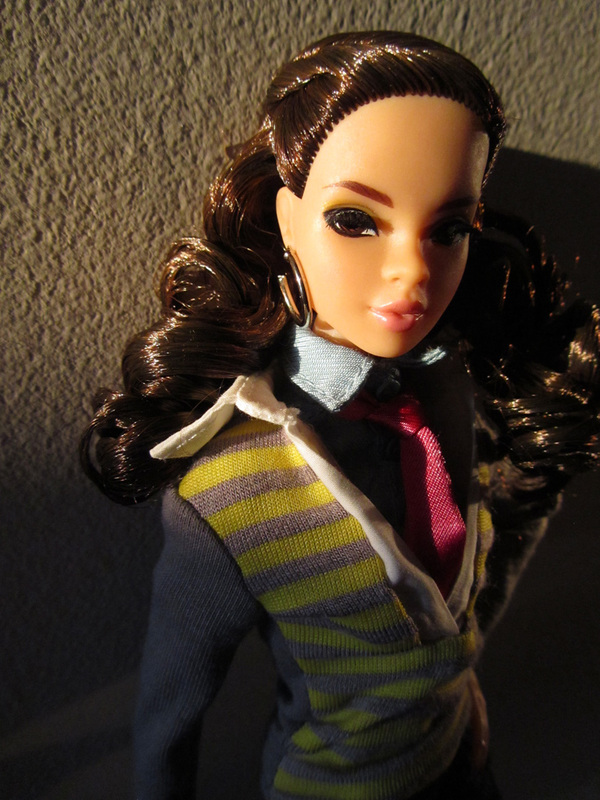 Hello from Spain: I love your new doll and her hair. I also really like the jacket she wears. I love your collection of dolls. Keep in touch. Congratulations and thanks for sharing! Your photo of Neve outside the telephone booth is my favorite - I wonder if she'll step into the booth and emerge as Super Doll ;-D.
If you like dolls with a mixed ethnic background, you might find the Mixis dolls by YNU Group interesting. I've started a Pinterest board for them. I like their rounder builds and their strong, ethnic faces. Their fashions are nice, too. Hey, Super D is not a bad idea! I've always wanted to photograph that phone booth and never had a chance to share until now. Will check out your Pinterest for sure!